A quick search of my Bible app shows there are more references to “bread and wine” in the Old Testament than one might think. In Genesis, the righteous priest/king, Melchizedek, brings out bread and wine as a sacrifice to God Most High. In Judges, bread and wine are sustenance for a weary Levite making his way home with an unlikely bride. In Ruth, bread and wine are the meal at the beginning of a blossoming romance. 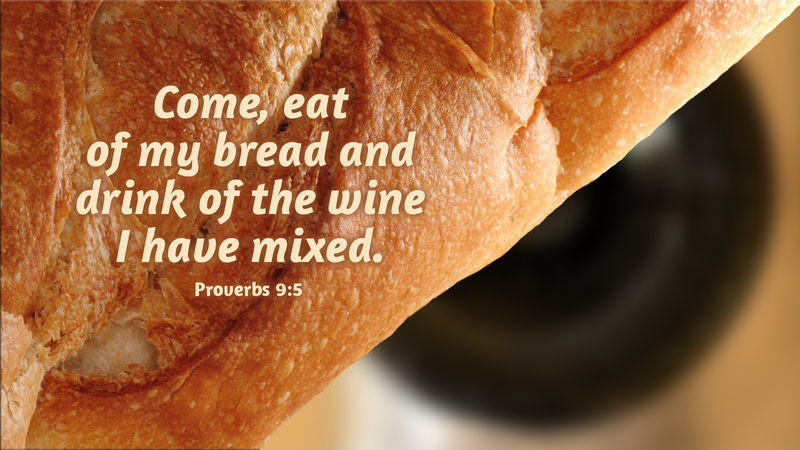 In Proverbs, Lady Wisdom spreads her banquet of bread and wine before the world, inviting the simple to eat and to drink. Given in her meal is understanding, knowledge, the fear of the Lord, and the gift of life. In the hands of Jesus, the bread and wine of the Old Testament find their fulfillment. Our most righteous Priest and King offers bread and wine in thanksgiving to God Most High. It is the sustenance given by a Rabbi to an unlikely bride, the Church, for the long journey home. It is the feast of Divine love, where our Bridegroom draws near. It is the Word of God’s banquet where he gives his very own Body and Blood for the life of the world. Prayer: Lord Jesus Christ, as we come today to receive your bread and wine that you have prepared for us, may we in faith receive the forgiveness of our sins and be filled with your wisdom, understanding, knowledge, reverent fear, and everlasting life. Amen. Today’s devotion was written by Ian Wolfe, Pastor of First Lutheran Church, Baker City, OR.